Vote in the four #FierceMadness play-in games before Tuesday at 10 p.m. ET. 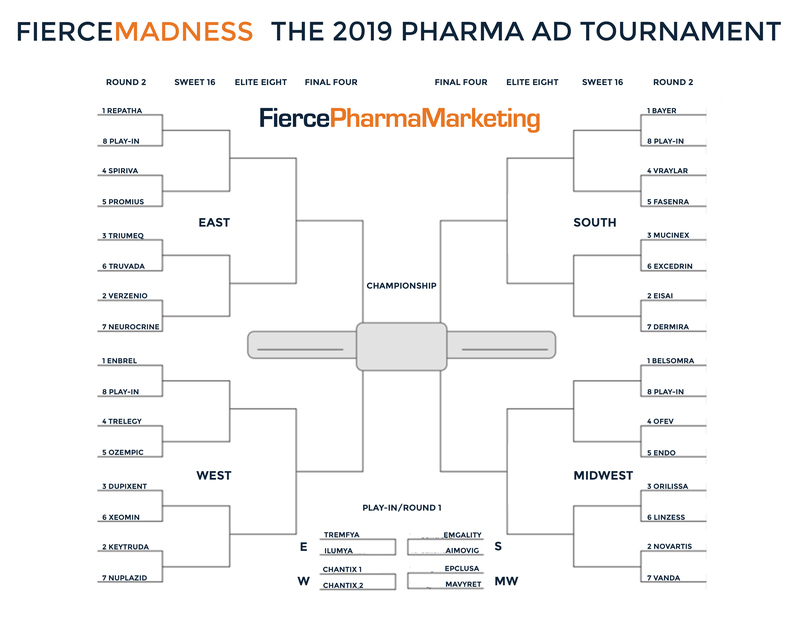 If it’s March, it must be #FierceMadness, FiercePharma’s annual take on the March Madness NCAA basketball tournament and bracket mania—with a pharma twist. This year we’re once again pitting pharma's advertising campaigns against one another on the road to the Final Four and ultimate championship. Here's how it works: Print yourself a bracket, choose a winner for each contest, and tweet us a photo of your completed picks before Tuesday at 10 p.m. ET using the hashtag #FierceMadness. That’ll also be the deadline for voting on the four play-in games that’ll help us narrow the field to 32 ads that'll kick off play on Wednesday. After that, we'll have new matchups for you to vote on each Monday and Wednesday through April 8 until we crown a victor! Most of the campaigns in the running include a TV ad component, and there's a reason for that. While TV has long been a staple in Big Pharma media plans, it has also become the price to play for smaller companies—especially when taking on Big Pharma drugs. The other reason for more recent TV ads from smaller pharma companies is to build widespread awareness or draw attention to a rare condition or treatment. The top 20 global pharma companies are well represented in the contest, but so are smaller contenders such as Sun Pharma, with a next-gen entry in the crowded psoriasis category; and Neurocrine, which is looking to introduce people to the movement disorder tardive dyskinesia. Think about it—could Merz launch its Botox competitor Xeomin without TV? Of course, everyone will have differing opinions on what makes a good—or bad—pharma ad, so when voting, please let us know why you picked the way you did. Was it edgy creative or a serious message for a great product? Maybe it was so bad it was good, or it just made you a laugh? We'd love for you to cheer the champs and dis the duds in the comments section on the poll form. Oh, and be a good sport—only one vote per round please. Before we get to the big contest Wednesday, we have eight play-in contenders up for vote. Cast your ballots here for the play-in winners in each region, and we'll be back with the four winners in the Wednesday issue of FiercePharmaMarketing. And once again, don't forget to check back every Monday and Wednesday through April 8 to vote on the next round! The first-to-market IL-23 psoriasis drug took on blockbuster Humira from AbbVie in this ad that also features red rashes that spell out messages. Ad: Chantix "My Favorite Role with Ray Liotta"
Tough-guy actor Ray Liotta starred in a series of commercials for smoking cessation drug Chantix talking about his struggle to quit and how he finally did it. Ad: Epclusa "Your Kind of Cure"
This is the first work from Gilead for its pangenotypic and lower-priced med for hepatitis C, Eplcusa. The maker of Ingrezza introduced viewers to involuntary movement disorder tardive dyskinesia, a side effect of antipsychotic meds. Happy family and dinner scenes are interrupted with flashing lights and sirens and the spectres of emergency workers to help viewers imagine the danger of sudden heart attack or stroke. Enbrel brought the children of rheumatoid arthritis patients to the forefront in the campaign where children, including Enbrel spokesman Phil Mickelson’s own kids, talk about how RA impacts their parent. Ad: Vyralar "House of Cards"
The Mucinex snot monster played off the Super Bowl, running ads before and after, to talk about “Super Sick Monday,” an actual phenomenon where millions of people call in sick the day after the game. This anthemic campaign puts heartland and hometown America in a forefront showcase of Bayer's now broad portfolio of healthcare, farming and family products.